The Huave are a small indigenous group that lives on a peninsula reserved for them called the Zona Huave. 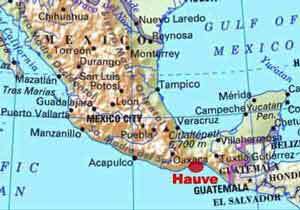 The Huave area is located on a peninsula formed by the Gulf of Tehuantepec and the Pacific Ocean near the Port of Salina Cruz Oaxaca. There are three types of terrain located in the area. Low forested hills, pastures and swamps. 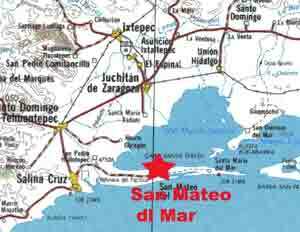 The towns are San Mateo de Mar, San Dionisio de Mar, San Francisco de Mar and Santa Maria del Mar. There are approximately 10000 Huave speakers which is part of the Otomangue group Huave trunk. The primary lively hood is fishing and traditional agriculture. Recently a handicrafts union has been attempting to introduce traditional weavings as a commercial product. The climate is similar to the other hot coastal regions on southern Oaxaca. There is a active effort in the village to rescue the back strap loom and embroidery.